Ramboll has received government backing for its twin replacement bridge designs to link Bermuda’s airport to the rest of the nation’s islands. The Bermuda Bridges concept will now move to a detailed design phase, following a public consultation on the proposal. The bridges are needed to replace two ageing crossings that have connected LF Wade International Airport with capital city Hamilton to the west and the town of St Georges to the east for over 50 years. 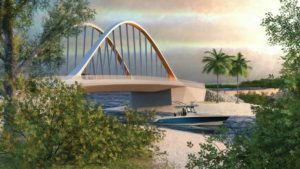 Detailed designs for the bridges will now be drawn up over the next six to nine months, with construction expected to begin next summer and a completion scheduled for 2021. A bascule bridge with a distinctive curved soffit, providing a 22m wide shipping channel giving access to St George’s harbour, will replace one of the current bridges. A 54m fixed twin arch bridge is set to replace the other ageing bridge. Each will carry two lanes of traffic with separated lanes for cyclists and pedestrians. In both cases the existing strategic crossings will remain fully operational while the new structures are completed. Ramboll bridges director Steve Thompson said: “The positive response to the designs at the public information session is excellent news. Ramboll has been acting as lead consultant on the project, with Knight Architects and Eadon Consulting also involved. Stay on top and informed. Receive industry-specific news and stay connected with the movable bridge industry. Make sure to also consider a Pro Membership to MBR.